While foreign films-- and especially the exceptional fare from Asia-- has always been ripe for American remakes dating as far back as Akira Kurosawa's Seven Samurai and Yojimbo (remade as The Magnificent Seven and A Fistful of Dollars) to Martin Scorsese's Oscar winning transfer of Infernal Affairs to The Departed to the latest crop of American horror remakes including The Ring, The Grudge, The Eye, and One Missed Call, something tells me that we will never remake Jet Li's The Enforcer. 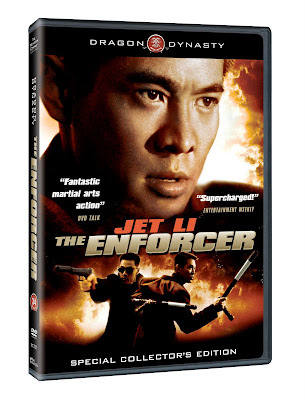 As a devoted Beijing father who must keep his identity as an undercover police officer hidden from his adoring son Johnny (martial arts child prodigy Tse Miu) and increasingly ill wife whose poor lungs are sending her into an early grave, Li turns in one of his finest and earliest multi-layered emotional performances. Yet it's one that grows increasingly impressive yet shocking when-- later on in the film after his cover is at the risk of being blown, he must stand by and watch a villain smash his eight year old's head through a glass table and then choke his own son into unconsciousness (knowing how long he can hold his breath) in order to prevent a brutal murder. Needless to say, child rights advocates would no doubt be having a stroke throughout. This is especially apparent first as the young tough Miu takes on a schoolyard full of bullies who step on the ants he's bringing home to make medicinal soup for his mother and rip on his father's hoodlum reputation. 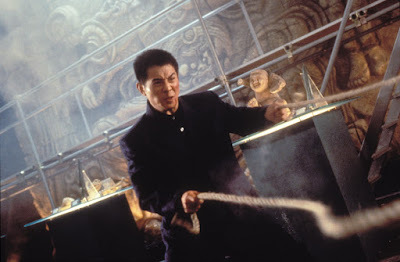 And it comes in once again later-- following of course the aforementioned near-death moment-- when Li whips his son around via a rope as they unleash some fists and kicks of fury on a Hong Kong organized crime syndicate. Obviously, it does make American audiences squirm in discomfort upon the realization of the overwhelming authenticity of stunt-work in Asian cinema and the fact that they're actually carrying out every movement. Despite this, it's nonetheless a remarkable achievement and one of Li's best films. 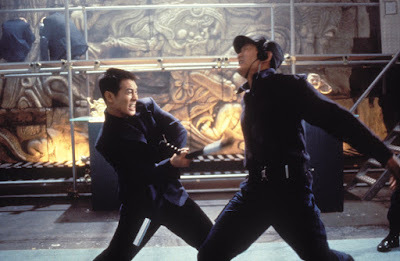 The Enforcer finds Li working with his frequent collaborator-- a.k.a. The Transporter director and martial arts choreographer Corey Yuen who has been one of Li's unceasing go-to guys partnering with him in numerous films overseas and then when they made their attempt to dazzle American audiences with Lethal Weapon 4, War, Cradle 2 the Grave, The One, (all of which found Yuen choreographing action and martial arts fight choreography), along with helming Li in Romeo Must Die and Kiss of the Dragon. And almost fifteen years later, The Enforcer still holds up particularly well in a sea of endless violence because of its ultimately moving family plot and emotional arc. When Hong Kong Inspector Fong ( Legend of Drunken Master and Rumble in the Bronx's Anita Mui) fills in for her married detective lover as Li's hostage and is let out of harm's way, she takes it upon herself to track down his family. She becomes a friend and confidante to his ill wife as well as the eventual guardian of Johnny following the mother's heartbreaking death of which Li's Kung Wei can only learn via beeper since he's deep undercover trying to stop Iron Monkey's Yu Rong Guang's corrupt group from obtaining Latvian bombs. 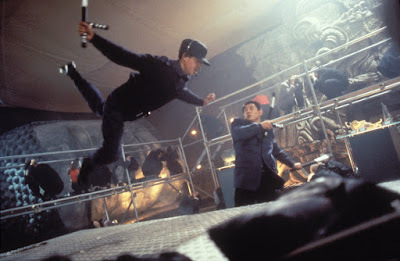 As the pint-sized version of Li, Tse Miu simply astounds from his earliest scene showing off the martial arts talent that first endeared him to the filmmakers one year earlier portraying Li's son in Yuen's The New Legend of Shaolin. Additionally, featured on this impressive Dragon Dynasty restoration, we see a thoughtful adult Miu recall working with one of his idols--Li-- and with particular fondness for the sadly departed Anita Mui whose patience helped get him through some of the film's emotional scenes as he cries at his mother's deathbed. Although initially when the film begins, it does looks grainy-- even on my trusty upconvert Sony Blu-ray Disc Player that usually improves quality tremendously-- with a few adjustments of the television's settings, soon the film's look improved considerably. However, this being said, it's a far darker work than those accustomed to the lighter, brighter, and faster Jackie Chan films so you'll want to set the film to vivid to get the most out of bravura night sequences such as when Mui and Miu take on a group of villains (in one of those extraordinary fights where it does a woman's heart good to see a woman and child take care of business to bone-cracking effect). Yet, in the ultimate evening showstopper, we find our breaths catching during a confrontation featuring a Nissan diesel garbage truck which finds characters fighting on the sides, underneath, all hanging on for dear life until Mui scales a rod-iron fence and dives through the windshield to stop the truck in a way that will make me never complain about parallel parking ever again. Granted one major drag about the film's otherwise superlative re-release is that it's dubbed in English-- a cinematic piece of sacrelig. I put up there right with the colorization of old black and white movies-- as certain overly American voice actors go way too far in their dubbing so that it borders on extraordinarily campy (particularly where the main villains are concerned) when the effect should be anything but. However as Dragon Dynasty's parent studio Genius Products released in a statement regarding this complaint, they reveal that there was "no usable version of the original-Cantonese-language track... in time for this release." And while I'm sure die-hard purists would've rather waited for that language track, Genius definitely lived up to their commitment to "bring together the best elements in the world in creating the greatest version of The Enforcer ever experienced on DVD in the U.S." as my prior recollection of the film was in poor quality videotaped bootlegs that the fan-boys in my largely Asian high school would trade around like baseball cards. So in the end, any version of The Enforcer is better than having it be absent from the Asian cinema landscape. And while certain scenes of Miu call up my maternal instinct so that it's damn near hard to look as he's flung about like a sack of potatoes around sharp glass and weaponry-- rest assured that in the hands of Jet Li, Anita Mui, and Corey Yuen, we realize just how much they valued the young man and how they knew that (perhaps even more than Li), his darling face would be the one that would remain forever etched in our memories. And I guess-- while it seems weird to look at it like that-- thanks to some of the harder to view sequences of startling brutality, we can rest assured that most likely nobody would have the audacity to remake Yuen's Enforcer, saving us from yet another subpar American re-imagining so we can savor Miu's turn in the aptly alternatively titled My Father is a Hero for years to come.